The launch of my second novel, a self-published ebook, was a quiet affair; the slipping into the world of an illegitimate child, as compared to the celebratory racquet of my first: a print book with a traditional publisher. 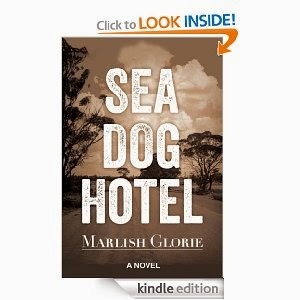 With my ebook Sea Dog Hotel an unshakable sense of failure prevailed, of it being second rate. It seemed strange. It was strange. My novel was in the ether. I had nothing concrete, nothing to hold. I was dealing with the abstract. It all started in 2006 when I began work on the manuscript, which was to become known as Sea Dog Hotel, a work of fiction of 78,000 words. Initially work on the manuscript was erratic, snatches of time in between working on my first novel and other commitments. In 2010 I finally had the space to give it more fuller attention, plus I had the help of an editor courtesy of my then agent who always reassured me that they would present it to a publisher when I was happy for them to do so. For a year and a half the manuscript bounced between my agent and me until I asked that it be presented to a publisher. Suddenly my agent did a turn-a-round and told me that she didn’t like the manuscript and to find myself another agent. Was I surprised? To be honest. Not really. By this stage I’d learnt that the publishing industry is one huge amorphous blob, where no one actually knows what’s happening. And where anything can happen - and usually does. I got another agent and in 2013 finished work on my manuscript. Problem was, with my new agent despite claims that she loved my work she felt it was too risky in the current publishing climate. I was told to present it to publishers myself, she might as well have told me to climb Mount Everest blind-folded. I knew it’d be impossible to get a publisher to take my manuscript seriously. Still, I sent it out to twelve publishers - all of whom rejected it. My agent told me to put it away and to get working on my next project. But after years of working on my manuscript, putting it away wasn’t an option. I decided to self-publish. Now the operative word here is — self. You’re the writer, the editor, the cover designer, the CEO; in short, you’ve become your very own publishing house. You’re it! It was fun, but it was lonesome. And “self” is distinctly, and greatly disadvantaged as far as marketing and publicity is concerned. The only tool at my disposable was social media. But it was to become a vital tool, not only for advice with things like, what title to give my book, but also for the greatly appreciated support and encouragement I received. It’s been truly amazing and heartening, giving me the much needed strength to launch Sea Dog Hotel. Throughout the development of my manuscript i.e. from when my first agent ditched me, I had had it professionally assessed twice, copyedited twice and proof read twice and also read by quite a number of friends for feedback. It’s impetrative to produce the very best book that you can. I knew that self-published ebooks had a bad reputation, that they were the bovver boys of publishing, not to be trusted, not be read. And from the self-published ebooks I’d read by other authors, to a certain extent this was true. Self-publishing authors still have a long way to go before they’ll be accepted as equals amongst traditionally published books. Self-publishing authors in the main need to brush up their act - to try and produce the finest work that they possibly can i.e. having their work professionally edited, assessed, and proof read. No short-cuts. And would I do it again? Should I not be able to find a traditional publisher for the current book I’m working on, yes of course I’d self-published, for its faults and limitations it’s a wonderful journey. My only hope is that in however many years time, self-published e-books have earned and subsequently gained a greater acceptance in the twin worlds of publishing and reading. So interesting to read, Marlish. From all of the reviews so far, you've done a great job of this novel. I can't wait for me e-reader, so I can read it! I do so hope you enjoy it, Louise. I hate to let people down. And yes, the reviews have certainly exceeded my expectations. Amazing really. Thanks Louise, I hope it doesn't disappoint. And yeah, things are going pretty well for Sea Dog Hotel. Certainly exceeded my expectations.